I find it very helpful to see the specifics of how other people are implementing a low-footprint lifestyle. And it’s fun to share such specifics! Today’s photo shows me rinsing off the grater after grating carrots and ginger to add to a spicy vegetable smoothie. I catch the food particles and rinse-water in one of those thick waxy plastic bags that are used to line cereal boxes nowadays. (I’ve used this bag over and over for months, mainly as a shopping bag for hot peppers or other small veggies from the farmer’s market). Once the grater is clean, I dump the contents of the bag outside to water and feed the yard. 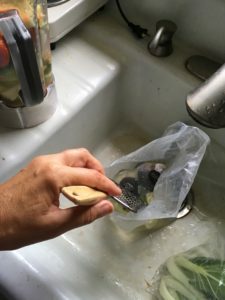 In this way the food particles and water become a resource, rather than a mess that needs to be washed down the drain (and quite probably clog the drain, since I have no garbage disposal nor do I want one — garbage disposals invite people to treat fruit peelings and other resources as waste). 1) People’s living circumstances, backgrounds, and priorities are many and varied. Rather than share an endless disjointed list of tips that may not be relevant to you, it’s more effective for me to convey a “low-footprint mindset” and encourage you to implement that mindset in your own unique way. You will then, just by being yourself, go on to exert a beneficial influence on people of similar background and circumstances to yours, who I would never be able to reach if I were merely sharing a laundry list of my own green lifestyle tips. 2) I firmly believe that the best asset is a positive attitude. (I’m not talking about phony “positive thinking”; I’m talking about a positive attitude that’s firmly rooted in practical reality.) To help you cultivate a positive attitude, I offer a lot of encouragement. After extended observation I’ve come to believe that encouragement is really the main thing most people need. 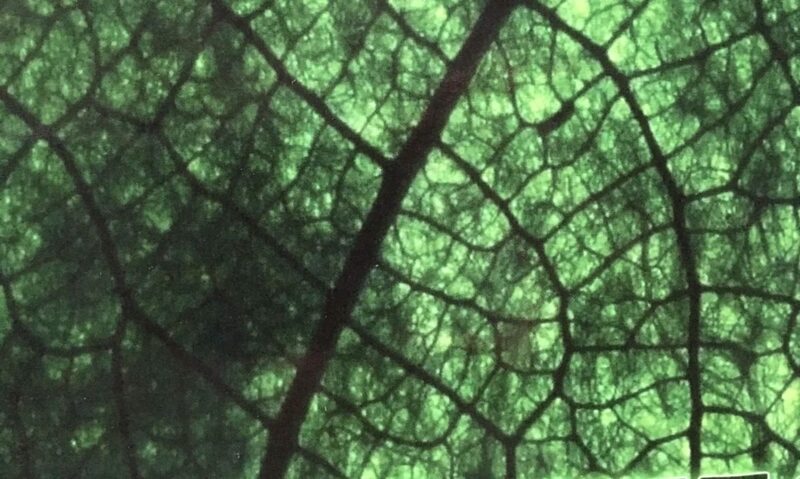 Most people I talk with nowadays are attempting to live their own version of a green lifestyle already, and they just need some emotional support to keep going. Although “green” is a hot buzzword these days, low-footprint living is still counterculture, especially in the USA. And choosing a lifestyle outside the mainstream, even for noble reasons, takes a lot of stamina and courage. Thus I offer you steady doses of encouragement. • The Riot for Austerity group on Facebook has been our main channel for the past few years. • Recently, one of our longtime members pointed out that Facebook is rather high-bandwidth and therefore high-footprint. And so we’ve reactivated our email group, the 90 Percent Reduction Yahoo Group. This group started back around 2007 but went dormant after our Facebook group was launched. As of last week, our Yahoo group is active again! Join either or both of these groups to connect with a wide variety of people from all over the world who are practicing the 90 Percent Reduction lifestyle (also known as the Riot for Austerity). You’ll get far more information and inspiration than I alone can provide. You’ll find good company and get a feel for just how committed our little grassroots movement is. One of the longtime members of the Riot movement started a Self-Introduction thread on the rekindled Yahoo group as a practical icebreaker. So far in this thread, I’ve seen low-footprint pointers on home insulation, water savings, bandwidth conservation, weddings, and more. (A couple of different members each shared their own version of how they were able to have the wedding of their dreams for $100!) It’s lovely to hear personal stories and get a feel for the many and varied versions of a low-footprint life. See you in the community! And thanks so much for allowing me, and this website, to be a part of your resource base for low-footprint living.